Issue: Do Media Reflect Contemporary Family Relationships? Associate Professor Leigh H. Edwards examines how families are portrayed in television and discusses how certain narrative tropes, trends, and genres present us with real family relationships representative of American society and culture. She raises the important point that reality television in particular presents viewers with real conflicts to which many families can relate, because the programs portray real cultural problems that have no easy answers. She concludes her argument with an assessment that public debates about family and marriage often frame the content of the families we see on television. Sarah Boxer examines the content of animated movies and questions why so many mothers in fairy tales and children’s films represent the absent mother. Since more American households are headed by married couples or single mothers, she questions the portrayals of mother figures, father figures, and step parents. Without mother figures, she claims, other characters have to step in to teach the lessons mothers often provide for their children, and audiences are left with questionable role models. Issue: Have Media Representations of Minorities Improved? Professor Drew Chappell-juxtaposes facts about recent actions attempting to ban ethnic studies and restrict immigration in parts of the United States with the television show, Dora the Explorer’s portrayal of a bilingual (English/Spanish) speaking girl, and discusses how the show introduces children to bilingualism, border identities, and multicultural discourse. Chappell discusses how the performance of identity in Dora’s world can teach children about what brings all humans together. Elizabeth Monk-Turner et al. revisit what has become a classic study in the portrayal of minorities in media and finds that even though how minorities are represented have changed within context, no serious changes to stereotypes have really occurred. In this study of prime-time television programming, little has changed within the 10-year time span between the classic Mastro and Greenberg study, and the analysis provided by the authors. 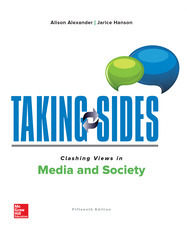 Issue: Have More Women Become Involved as Decision Makers in Media Industries? Hannah McIlveen challenges the dominant male culture of decision makers in television to discuss how women have been making inroads in nontraditional programming on the Web. Working in low-budget situations does not stop their creativity, and even television network executives are paying attention to new content from women creators on the Web. Every year, Professor Martha M. Lauzen, Ph.D., conducts a survey of the roles of women in prime-time television at the Center for the Study of Women in Television and Film at San Diego State University. In this report, she provides data for the 2014–2015 television season, and women are still underrepresented in prime-time television. Issue: Do Digital Technologies Influence Our Senses? Saga Briggs is a writer and the Managing Editor of InformEd, an online resource for educators based in Australia. In this article, she compiles recent data to suggest how our brains adapt to the use of digital technologies over time. Based on the work of neuroscientists, she argues that there are several ways in which technology influences our behavior and “rewires” our brains. She discusses six ways in which we become conditioned by our interaction with technology. Her article particularly focuses on users (like teens) who seem to use digital technology 24 hours a day, 7 days a week. Tristan Harris was the design ethicist for Google for 3 years. Based on his experience and his knowledge of how technology companies operate, he argues that the companies exert much more influence over our behaviors than we do. In other words, he believes that we are being conditioned by the companies to behave in certain ways, rather than our minds or bodies responding to the type of influences caused by technologies themselves. He does however note that technology companies have become experts in structuring information that exploits our human vulnerabilities. Issue: Do Media Cause Individuals to Develop Negative Body Images? June Deery examines the role of reality television and body makeover programs and concludes that these types of programs normalize the idea that bodies can and should be improved by plastic surgery, weight loss, and control programs, and that women in particular should subject themselves to all measures to find “success” and “happiness.” She theorizes that these programs assume that women in particular do have negative body images, and that the real messages of these programs are that surgical steps can and should be taken to improve one’s poor body image. Michael P. Levine and Sarah K. Murnen also investigate magazine ads, but find the assumption that media cause eating disorders to be too limited. Instead, they cite a wide range of social, behavioral, and cultural issues over time to understand the complex conditions under which girls begin to adopt negative body issues that result in eating disorders. Issue: Is Product Placement an Effective Form of Advertising? Professors Kaylene Williams et al. chronicle the evolution of product placement and define the term as incorporating “commercial content into noncommercial settings.” They discuss the subtle differences between brand placement and product placement and raise the topic of how product placement is becoming more common in many media forms, including music and games. Professors Karniouchina, Uslay, and Erenburg analyzed 40 years of movies (1968–2007) to uncover the idea that product placement has become a tactic that no longer interests viewers of major motion pictures. As a result, they suggest that marketers should investigate other ways of trying to connect ideas and brand identities. Issue: Is There Any Harm In Taking Selfies? British journalist Elizabeth Day thinks of selfies as modern-day self-portraits. Despite their popularity, she sides with critics who consider selfies to be narcissistic and expressions of our self-absorbed lifestyles. The New York Times reporter Jenna Wortham claims that our predilection for responding to faces is just a part of a more technologized world, and that while we shouldn’t discount the selfie phenomenon, we should also keep in mind that selfies are a type of visual diary. Issue: Is Networking Through Social Media Contributing to the Growth of Fake News? Technology writer Farhad Manjoo has interviewed Mark Zuckerberg, founder of Facebook, on many occasions. In this article, he discusses how Zuckerberg and the Facebook staff reacted to what was being written and said about Facebook’s role in disseminating “fake news” prior to, and during the 2016 Presidential election. The article discusses whether Facebook’s attempts to create connections among users have actually contributed to the spread of lies, misinformation, and fake news, and whether social media has a responsibility to monitor information that can mislead the public, particularly through its News Feed feature. Providing an overview of news gathering and dissemination processes for the last hundred years, David Uberti highlights some of the historical precedents that stirred up controversy about whether the news media spreads misinformation or not. He shares the perspective that over time, different forms of media have participated in misleading the public. Even though he cites PolitiFact as the source of calling fake news in 2016 the “Lie of the Year,” he is critical of how mainstream media have contributed to the public’s distrust of all forms of news media. Issue: Does Media Coverage Encourage Mass Shootings and Terrorist Attacks? Journalist and editor Mark Follman reports that mass shooters claim to be inspired by previous massacres. A desire for fame is enhanced by the coverage achieved in previous shootings. Copycats plan their actions to be seen by the media and the public. Changing how media covers these stories may reduce the likelihood of subsequent copycats. Follman urges media organizations to create industry standards for coverage of mass shootings. While Professor Charlie Beckett acknowledges that terrorism relies on publicity to disrupt society, provoke fear, and demonstrate power. Journalism has a responsibility to help society cope with this complicated problem, but faces challenges of verification, dealing with propaganda, and the speed of the news cycle. Better reporting is needed, but journalists cannot shirk the responsibility to be independent, critical, and trustworthy. Issue: Are Polls an Accurate Assessment of Public Opinion? Sheldon R. Gawiser and G. Evans Witt have a vast experience in developing polls and analyzing the results of polls. Their belief in the accuracy of polls to reflect public opinion is grounded in decades of experience, and in the scientific accuracy of the poll. They provide advice to journalists on how to measure the worth of a poll in terms of its scientific rigor as opposed to its casual approach toward accuracy. Herbert J. Gans discusses how news media personnel often portray public opinion through polls inaccurately. He makes an important distinction between the way people answer polls and the definition of public opinion. Issue: Are Twitter and Other Social Media a Good Source of Political Information? In these sections of their longer study on the role of Twitter and politics, Professors John H. Parmelee and Shannon L. Bichard examine how political leaders use Twitter to influence the public. While politicians establish personal relationships with followers, some tweets are intended to influence policy. They examine the potential for the one-way form of communication provided by Twitter to engage with the public. Clay Shirky turns this issue around by asking about the use of social media to effect change within authoritarian regimes. He describes situations in which protests have been arranged by text. It is in the use of social media to coordinate actions and develop shared awareness that their power resides. But, he warns that these tools can be ineffective and cause as much harm as good. Issue: Does Technology Invade Our Privacy? Daniel J. Solove, professor of law at George Washington University and authority on privacy issues, argues that privacy is too often sacrificed for security concerns. He argues that there are often solutions that do not involve such sacrifices, but that they are dismissed by an all-or-nothing attitude. Stewart Baker, former assistant secretary for Policy at Homeland Security, argues vigorously for better collection and use of technological information. Its importance in preventing acts of terrorism, in tracking potential criminals, and in protecting the interests of the country far outweighs privacy concerns of individuals. Issue: Should Corporations Be Allowed to Finance Political Campaigns? Conservative author Thomas R. Eddlem makes the case that corporate media institutions influence the messages that the public sees and hears. As a result, the Supreme Court’s 2010 Citizens United decision, which gives corporations the right to make political contributions and creates the possibility of the establishment of SuperPACs, also results in the exercise of freedom of speech. David Earley and Ian Vandewalker, two counsels at the Brennan Center for Justice at the New York University School of Law, argue that the rise of political spending that resulted from the Supreme Court’s Citizens United decision has created a situation in which political elections can be “bought” by corporate donors. Because of the new law, they argue that the only way to ensure transparency is to create a situation in which all political donations are disclosed to the public. Issue: Does Drone Journalism Challenge Journalistic Norms of Privacy? The access afforded by drones is rewriting privacy laws according to Law Professor Kaminski. She explores the complexity of privacy issues, including the range of national, state and local regulations and practices that often conflict. Drone regulation, she notes, is about much more than sunbathing teenagers. The Amici Curiae brief filed with the Federal Aviation administration represents media industries arguments to protect First Amendment rights of newsgathering organizations in the evolving regulatory environment. They warn against the “chilling effect” on news of several actions including banning the use of drones for newsgathering. Issue: Can Anything Be Done about Trolls and Online Harassment? Technology writer Andy Greenberg discusses the problem of online harassment and argues that many people are being driven off of the Internet because they cannot speak or write what they feel, even in jest, because social media organizations are not set up to police personal expressions. But now, Google has a subsidiary called Jigsaw that can moderate political or personally motivated cyberattacks through artificial intelligence. Drawing heavily on the experiences of a number of women, some of whom were victims of online harassment through Gamergate, Greenberg believes that technological solutions may be found to curb online trolling and personal harassment. Elisabeth Witchel consults with the Committee to Protect Journalists, an independent non-profit dedicated to journalistic integrity and protecting the rights of journalists around the world. In this article she discusses the problem of trolling from some people who have acted as trolls, but also, from people whose lives have been affected by trolls. She addresses the psychology of people who troll, and addresses the question of whether trolling is a manifestation of cultural sickness. She also identifies people who have been the victims of trolls and their responses. Issue: Is Streaming the Future of the Music Industry? Journalist Joan E. Solsman discusses the rise of streaming services like Pandora and Spotify, and identifies three business models that are emerging for the number of streaming services. Her article shows how divergent the forms of distribution for music have become, and the impact on artist revenue for some of those new services. Journalist Charles Arthur discusses some of the same streaming services, but identifies how little profit many of them are making because consumer tendency to download free music cuts into the revenue of many of the emerging services. Issue: Is There a Future for Digital Newspapers? An in-depth analysis of The New York Times digital strategies by Gabriel Snyder illustrates how traditional companies can move into the world of digital newspapers. The Times strategy is to invest heavily in their core journalism offerings while continually adding new online features. By 2016, the Times was making nearly $500 million in digital revenues. They now believe they can make the economics work. Michael Rosenwald quotes early digital journalist, “I have come to realize that replicating print in a digital device is much more difficult than what anybody, including me, imagined.” Digital editions have not proved to be the replacement revenue stream that was envisioned and the assumption that readers prefer the immediacy of digital now seems questionable. To this author, the future of print journalism will be the traditional newspaper. Issue: Are Digital News Services Good for the News Business? When he was a Shorenstein Fellow at Harvard University, David Weinberger investigated the brief history and impact of open source news gathering and dissemination. His study of how open source architecture influenced the quality of news at National Public Radio, the New York Times, and The Guardian. Calling the system API (application programming interface), Weinberger examines the impact of sharing information with other media companies and individuals over the Internet. Though the systems started slowly, he is optimistic that in time most news gathering will be conducted with APIs. Jonathan Stray, a technology writer and teacher at Columbia Journalism School addresses the technologies and sharing sites as a more automated method of gathering and disseminating news and information. With artificial intelligence (AI) and algorithms that scour social media (like Twitter and Google), these “cyborg” technologies notice what is trending and what people are sharing. This type of topical news generation can result in stories and videos that are put together more quickly than a person could assemble the pieces for a finished story. However, Stray thinks that it will be a long time before AI can be effectively used to replace human journalists. Issue: Can Digital Libraries Replace Traditional Libraries? Harvard University Library Director Robert Darnton suggests that a new model of publishing scholarly work may need to be created to preserve ideas in electronic form. The traditional library, he says, relies on a financial model that is no longer sustainable. The result, he suggests, is to continue to convert scholarly research to digital data and for libraries to specialize, and cooperate in their lending processes. Historian and Harvard University Professor Jill Lepore examines the efforts to collect digital information—particularly Websites—through the Internet Archive, but provides frightening data on how incomplete the archive of digital data is, why that happens, and what consequences occur because of incomplete records of digital data. Issue: Can Journalism Stand Up To Attacks on Freedom of the Press? Marvin Kalb sees Trump’s dismissive treatment of news media as a significant attack on freedom of the press. Calling media “enemies of the American people” was reminiscent of the language of Mao Zedong and Stalin. Undercutting the media is a strategy of authoritarianism; preserving democracy requires a free press. Philip Bennett and Moises Naim look at press freedom in a global and digital context and find censorship on the rise. They argue that governments are having success in disrupting and undercutting independent media to determine the information that reaches society.